As discussed on the podcast, and as suggested by AlexF, we are compiling two top ten lists. Your top ten Dredd stories of all time. And your top ten non-Dredd thrills. And if a story appeared in the Judge Dredd title then it's a Dredd story. But anything that appeared under its own title goes into the non-Dredd list. So Midnight Surfer and Oz are Dredd stories, but Song of the Surfer is not. If that makes sense. If anyone's vote needs clarification I will contact them. Is it just a list of titles you want, or reasons for choices? Happy to take reasons. May get to read some of them on the show. I'm sure it came up elsewhere, but does America count as Dredd or non-Dredd? I don't remember it being under Dredd when originally published but suspect current editions are. 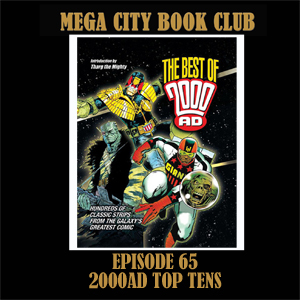 America was published with a Judge Dredd title on its first run in the Megazine. 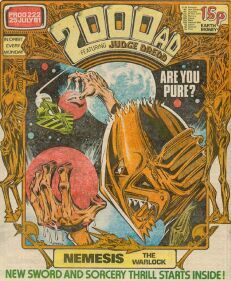 Been left off at some point and I suspect it was misinterpreting this that led to its current classification of not being a Judge Dredd story. Yes, I'm calling America a Dredd story. It’s an impossible question and the answers I will give will depend on what occurs to me at the time. "The effect Judge Morphy's murder had on Dredd -- blimey! He nearly MURDERED the perp!. I first read that story years and years ago (and many times since) and I still remember the suspense from that first reading when you don't know what Dredd will do. Would he have gone all the way if Kraken hadn't been there? I think Wagner should explore this angle again if he ever writes the demise of Dredd's career/life. "My favourite ever episode of any story is the one where Kraken rescues the hostages. He walks alone into the building, unarmed, in handcuffs, and surrenders. Then he disarms a terrorist, massacres the lot of them and saves the hostages single-handed. The other judges outside storm in fearing the worst... and he's just standing there like "can I help you?" They give him a round of applause when he walks out. Even Dredd is impressed. There is this page by Will Simpson with Kraken crouching in the middle, blazing away, and around him are four panels showing each terrorist getting blown away, falling through windows and over furniture, and huge gouts of blood spraying everywhere. "In the epilogue story, By Lethal Injection, Kraken executes himself to prove he was worthy to be a judge. He's all calm and defiant, and all the other judges are watching and can't quite believe it. And it had Carlos Ezquerra's best artwork out of the entire Necropolis epic." I'm too lazy to give reasons for all of my choices. But I had to mention Death of a Judge (prog 137). It's a great introduction to Dredd's character for new readers, and a brilliant illustration of his morals and viewpoint. A judge is murdered at the beginning, and another judge who was in love with her storms off to murder (not execute) the perps who did it. Dredd kills the judge to stop him murdering one of the judge-killers. I was shocked the first time I read that, as a kid, but I also admired Dredd's decision. I also liked the trick title: you assume it refers to the death at the beginning, but it's really about the death of another judge at the end. Cockroaches is just a brilliant and twisted idea for a story. I could happily read 30 episodes about that guy! Nemesis Book VI is just one of the best things 2000AD has ever done. The vision of how the world ends and what ultimately becomes of the human race is something that has always stayed with me, and the crime Torquemada commits there elevates him to the most appalling villain in the whole comic. And there is a great little epilogue episode where Thoth is hunting down Torquemada's earlier incarnations, and he meets Colonel John Chivington of the US Cavalry in the 19th century, and it's all about the real-life massacre at Sand Creek, but without Pat Mills getting too preachy, just letting the facts speak for themselves. I was probably about 12 when I read it, and it was the first time I'd seen the Americans portrayed as the bad guys. It blew my mind. 2000AD at its best. I'm going to repeat what I've said before. To me, the greatest Dredd story will always be "Alone in a Crowd". Notwithstanding Dillon's first and finest work on Dredd (for me), the multilayered story is incredibly subtle and intricate. It captures perfectly the depersonalising nature of the meg, the claustrophobic quality of existence, the multiple threats citizens face, perps and normal 'citz' alike. As a commentary on the tensions of modern life it works perfectly. More to the point, it drives home its point so surreptitiously. It is an absolute masterclass. 5. Bury My Knee At Wounded Heart: pathos! 7. Cry Of The Werewolf: "Grim"
2. Zenith [Phase 1] - "Oh dear, I think I broke him"
1. The Apocalypse War. Informed the future of Dredd's world like nothing else. 2. Day of Chaos. Wagner's game-changer turned everything on its head. 3. Tour of Duty. Richly detailed and nuanced. 4. The Pit. Showing the human side of judges. 5. Necropolis. Showing the horror more than the humour of Death and co.
6. The Dead Man. John Ridgway's hugely atmospheric art and that twist. 7. Trifecta. A crazy drunken idea that worked brilliantly. 8. Blood of Emeralds arc. Dredd's future is in safe hands. 9. Oz. Supersurf 10 is as gripping as a real race. Brendan McCarthy's Judda are one of his all-time best designs. 10. Midnight Surfer. The illicit exhilaration is tangible. 1. Cradlegrave. You can feel the decay. Just brilliant. 2. Strontium Dog - Portrait of a Mutant. Seminal, universal story of fight against oppression. 3. Strontium Dog - Rage. And when that fight becomes darker and personal. 4. Devlin Waugh - Chasing Herod/Reign of Frogs/Sirius Rising arc. John Smith's imagination is boundless. 5. Anderson - Half-Life arc. Some of Arthur Ranson's panels could be on the walls of galleries. 6. Rogue Trooper - Cinnabar. The best original Rogue story, in my opinion. 7. Indigo Prime - Killing Time. Creators at the top of their game. 8. Brass Sun. INJ Culbard's precise art depicting the clockwork system and inhabitants with cinematic brilliance. 9. Slaine - The Books of Invasion. Clint Langley's widescreen images are something else. 10. Chopper - Song of the Surfer. A truly great character of Dredd's world, brilliant art by Colin MacNeil, a tragic ending...what's not to like?